Industrial needs are to be met by industrial solutions. 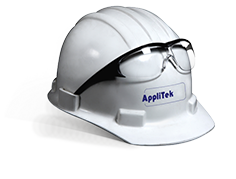 AppliTek is able meet strict regulations for the construction, including materials as well as design requirements in hazardous locations. AppliTek engineers and constructs the most complicated explosion proof projects: shelters, cabinets and analyzers (ATEX, BASEEFA, …). All Ex-proof systems are supplied with a certificate and comply with our customers’ standards; e.g. European (Cenelec), American (NEC500), and all other standards. AppliTek also provides a program for repackaging analyzers to comply with your Ex-proof needs. Please contact us on the possibilities for this.